Blurry vision, spots, glare at night, flashing lights -- these are common eye complaints. Each could be a harmless annoyance or an early sign of disease. It isn’t always easy to tell the difference. 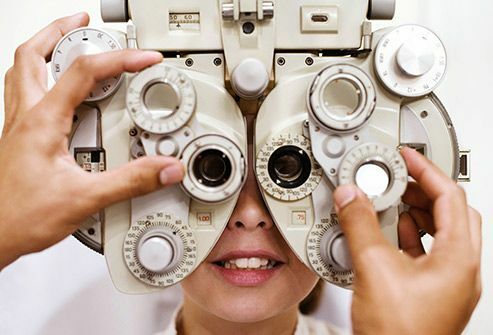 Visit your eye doctor promptly if you notice any changes in your vision. Which number do you see on the far left? If it's "3," you probably have normal color vision. If it's a "5," you may be color blind. The center panel shows a mild lack of color vision. 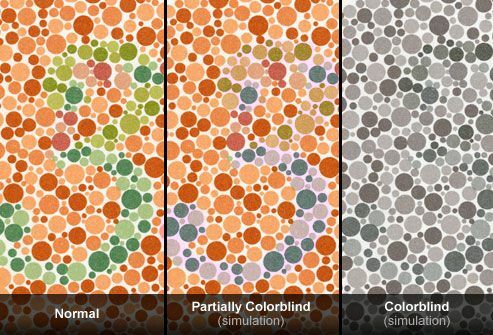 Complete color blindness, which is rare, appears at right. No number is visible. Tinted glasses may help you see better. 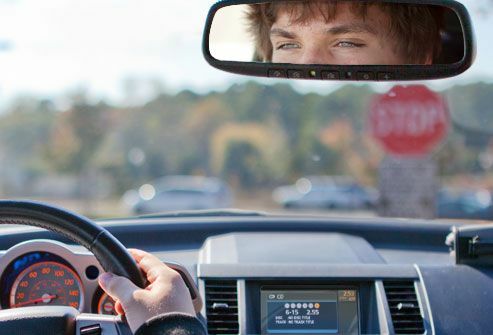 Nearsightedness can make it harder to drive, play sports, or see a blackboard or TV. Symptoms include blurred vision, squinting, and fatigue. To correct it, you can wear glasses, contacts, or get surgery in some cases. 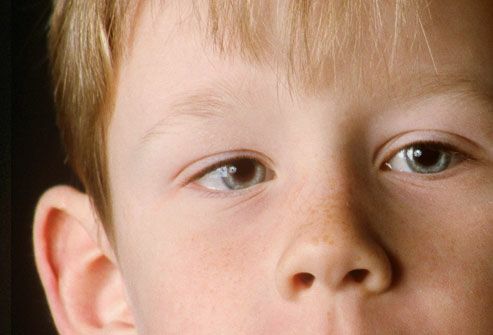 Most people are born with mild farsightedness and outgrow it in childhood. When it persists, you may see distant objects well, but books, knitting, and other close objects are a blur. This problem runs in families. Symptoms include trouble with reading, blurry vision at night, eyestrain, and headaches. To treat it, you may wear glasses or contacts. Some people get surgery for it. Trouble reading fine print is a sign of aging. It's called presbyopia, which means "old eye" in Greek. Most people start to notice it in their 40s The eyes' lenses become less flexible and can't change shape to focus on objects at reading distance. The solution: Wear reading glasses or bifocals, which correct both near and distance vision. If you wear contacts, ask your eye doctor about contacts made for people with presbyopia. The cause is usually an eyeball that's too long. Or it can result from an oddly-shaped cornea or lens. Light rays focus just in front of the retina, instead of directly on it. This sensitive membrane lines the back of the eye (seen in yellow) and sends signals to the brain through the optic nerve. Nearsightedness often develops in school-age children and teens, so they may need to change glasses or contacts frequently as they grow. It usually stabilizes by the early 20s. 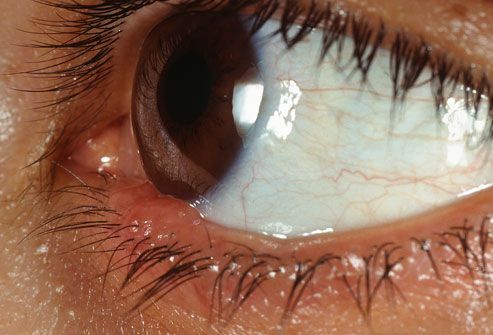 This problem results from an eyeball that’s too short or an oddly-shaped lens or cornea. Light rays focus behind your retina and close objects look blurry. Your distance vision might be fuzzy, too. 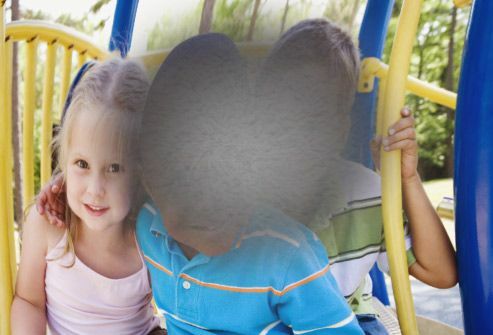 Severely farsighted children often have crossed eyes (strabismus) or lazy eye (amblyopia) and may have trouble reading. 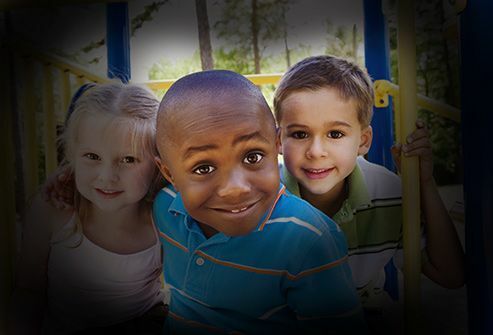 That’s one reason eye doctors recommend vision exams for young children. 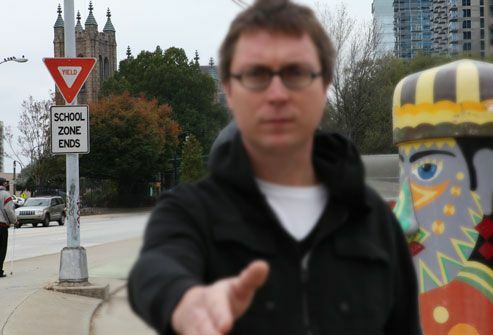 If you have astigmatism in one or both eyes, your vision may be out of focus at any distance. 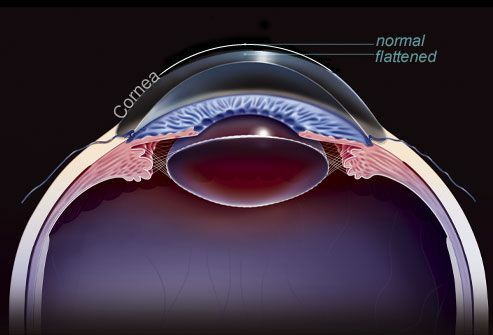 It happens when the cornea, the clear “window” that covers the front of the eye, isn’t shaped right. Light rays can’t focus on a single point on your retina. Instead they scatter to many places. Glasses or contact lenses correct it. Surgery may be an option. Symptoms include blurred vision, headaches, fatigue, and eye strain. Do you dream of seeing clearly without glasses? Surgery to reshape your cornea can correct nearsightedness, farsightedness, or astigmatism with a success rate of better than 90%. Surgery may not be right for you if you have severe dry eye, thin or oddly shaped corneas, or severe vision problems. Side effects include glare or sensitivity to light. You can’t feel it, but this disease damages your optic nerve. You may not have any symptoms until you lose your central vision. Your side vision will go first. That’s why you need regular eye exams every 1 to 2 years, especially after you turn 40. 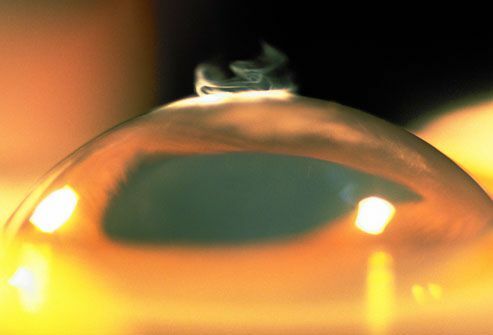 Doctors can treat glaucoma with medications or surgery. Your eye is filled with fluid. Sometimes too much of it builds up and raises pressure inside your eye. This can damage your optic nerve, a bundle of nerve fibers that carries information to your brain. Without treatment, glaucoma can cause total blindness. 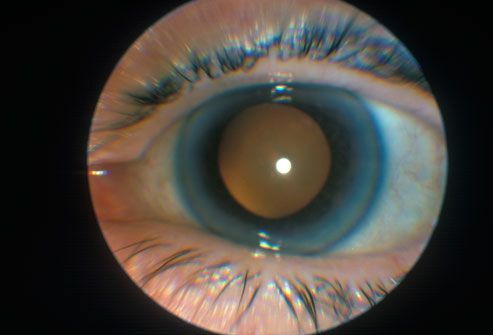 The bright yellow circle shows an optic nerve head damaged by glaucoma. 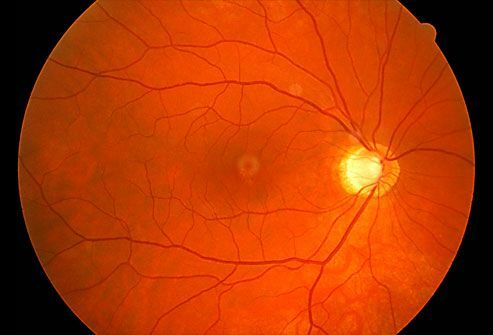 The dark central area is the macula, which controls your finely-detailed central vision. 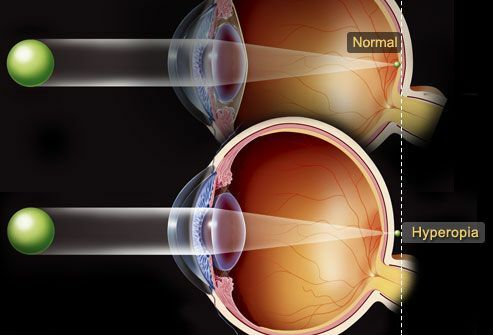 Age-related macular degeneration (AMD) damages and then destroys your central vision, making it hard to read or drive. Symptoms can include a central blurry spot or straight lines that appear wavy. You're more likely to have it if you are older than 60, smoke, have high blood pressure, are obese, are female, or have a family history of the condition. See your eye doctor regularly to check for AMD. 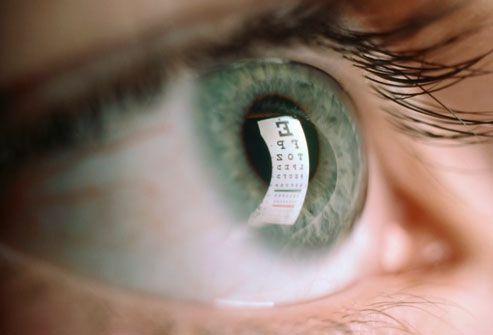 Prompt treatment can help slow vision loss. 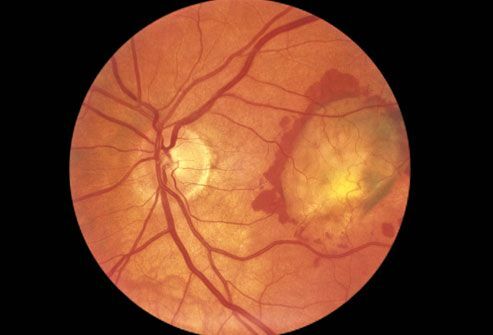 Dry: Doctors often see yellow deposits called drusen in the macula. 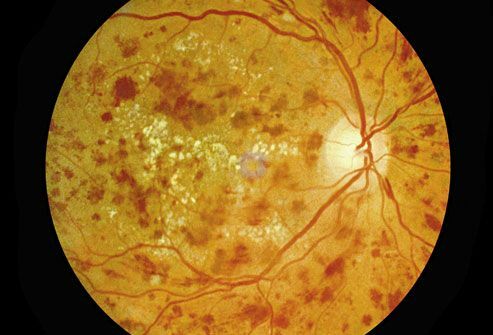 As it worsens, the macular tissue breaks down. That slows the delivery of images to your brain. Wet: Abnormal blood vessels grow in your eye. They leak blood and fluid (shown here), which causes scars and further damages the macula. Both types leave you with a central blind spot. 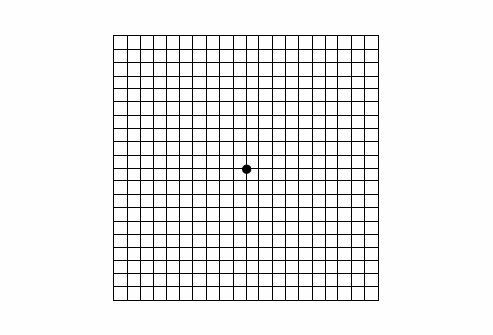 Cover one eye and stare at the center dot in this Amsler grid from a distance of 12 to 15 inches. (You can wear your reading glasses.) Do you see wavy, broken, or blurry lines? Are any areas warped or just plain gone? Repeat for your other eye. Although no self-test can take the place of an eye exam, this grid is used to help spot early symptoms of AMD. Next: See how this grid looks with AMD. 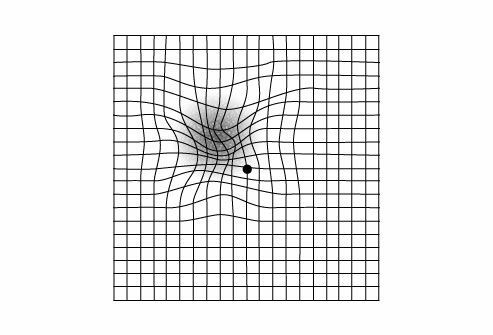 As seen here, the Amsler grid can look quite distorted to if you have severe macular degeneration. It may include a central dark spot. Straight lines that appear wavy are also cause for concern, as they can be an early symptom of wet AMD, the more serious, fast-moving type. See your eye doctor right away for a thorough exam. Type 1 and type 2 diabetes can cause partial vision loss (shown here) and lead to blindness. The damage involves tiny blood vessels in your retina. It can often be treated, but don't wait for symptoms. By the time you have them -- blurry vision, spots, shadows, or pain -- the disease may be severe. If you have diabetes, get an annual eye exams. The best prevention is to keep your blood sugar in check. High blood sugar levels damage the tiny blood vessels that support your retina. They can swell, break, and leak fluid. Somtimes dozens of new, abnormal blood vessels grow. This is called proliferative retinopathy. They’re fragile and break open easily. 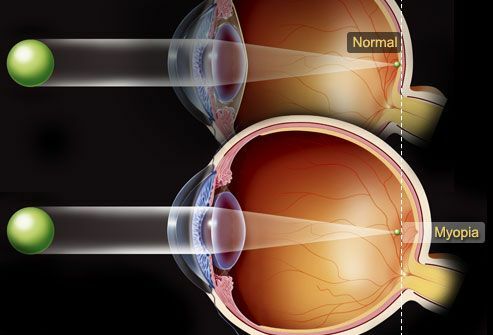 Over time all this can damage the retina and cause blurred vision, blind spots, or blindness. 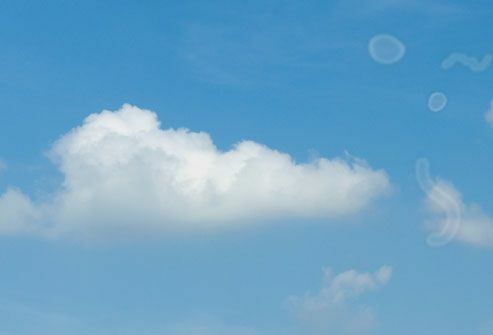 By age 80, more than half of us will have had a cataract, or cloudy lens. Your vision slowly gets foggy and it gets hard to read, drive, and see at night. Diabetes, smoking, or too much time in the sun raise your chances. Surgery that replaces the clouded lens with an man-made one works well. A healthy lens focuses light into a single spot on your retina. It captures the image like film in a camera. As you age, protein builds up in the lens. It gets cloudy and sends scattered rays of light to your retina. Instead of one sharp clear image you get blurred vision, changes in color vision, and glare, especially at night. Advanced cataracts are easy to see. It’s the muddy-colored circle at the center of this picture. You can inherit this disorder from your parents. It often begins with night vision problems. Next comes a slow loss of side vision. That becomes tunnel vision and finally, in some cases, blindness. High-dose vitamin A supplements can reduce vision loss and an implant that can restore some vision is in the works. But see your doctor before you take supplements. Too much vitamin A can be toxic. The light-sensitive tissue of the retina slowly breaks down over many years. As that happens, it no longer sends signals to your brain, and you lose some vision. 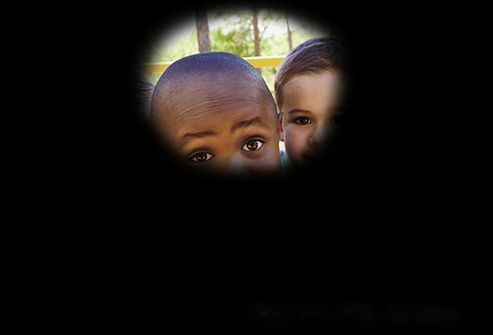 Eye exams show abnormal dark spots (pigments) sprinkled around the retina. 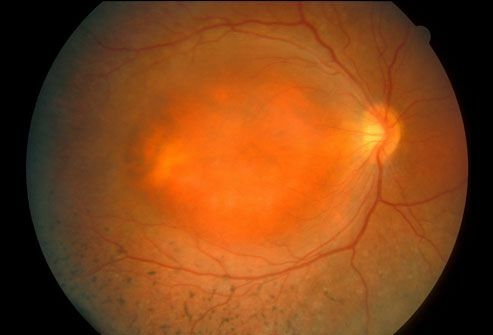 Early cataracts can also happen, along with a swelling of the retina called macular edema (the central orange mass shown here). They show up or multiply suddenly. You also see flashes of light. You see white or black spots all the time. 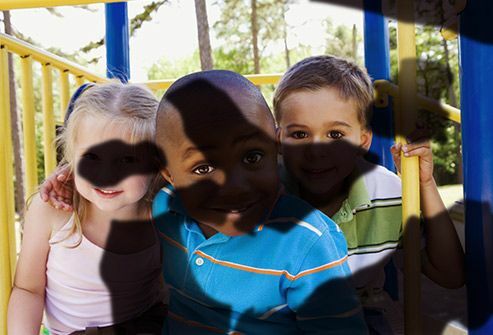 You notice a sudden shadow or loss of side vision. When you’re a child, if one eye doesn’t see well, your brain may favor the other. This condition, called ambylopia, can happen if your eyes aren’t aligned right (strabismus or crossed eyes) or one eye just doesn’t work as well. The doctor will prescribe a patch or drops that blur vision in the "good" eye. This prompts your brain to use the other eye. 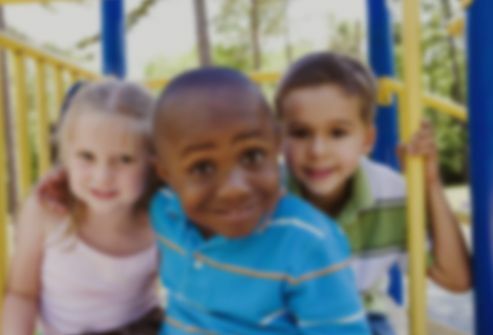 If amblyopia isn’t treated during childhood, it can cause permanent vision loss. Because so many nerve endings lie just beneath the surface or your cornea, even a tiny speck can be painful. Don't rub your eye, or you could cause serious damage. Wash it it with lukewarm water. If it object doesn’t move, call a doctor. He can remove it and give you antibiotic drops to prevent an infection. This inflammation results from a virus, bacteria, irritant, or allergy. Your eye will get red, and itch or burn. You’ll also notice a gunky discharge. 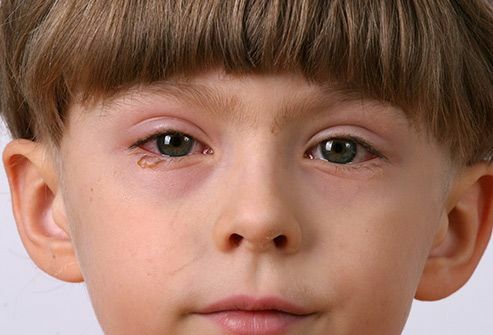 If your eye itches an allergic is probably to blame. The type you catch from other people is usually viral, so you won’t need antibiotics. 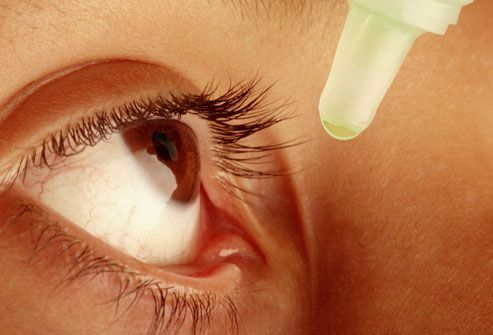 If your pinkeye is caused by bacteria, the doctor will give you antibiotic eye drops. Pinkeye can be very contagious, so wash your hands often while you wait for it to clear up. This painful red bump looks like a pimple on or near the edge of your eyelid. 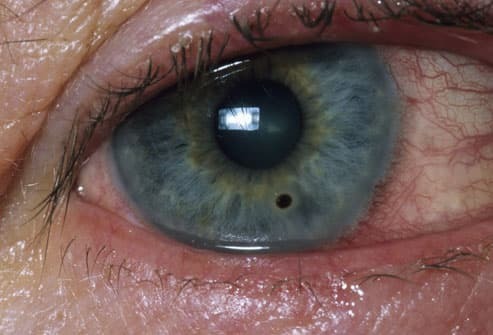 It’s a type of infection of the eyelids (the doctor will call it blepharitis). Styes usually heal in a week. You can speed things up by putting a a warm, wet compress on it 3 to 6 times a day. Don’t wear contacts or eye makeup until it heals. They can cause itchy, watery eyes. Pollen, grass, dust, weeds, and pet dander are common triggers. An allergy doctor can tell you what’s to blame for yours. Keep your windows shut at home and in your car. You can get special pillow and mattresses covers to keep allergens out. Clean your house thoroughly and use allergen filters in your furnace and air conditioner. Allergy eye drops, artificial tears, and antihistamines may help. You need regular checkups all through your life, especially if eye problems run in your family or if you have other risk factors. An eye exam can also find other problems, like diabetes and high blood pressure, or even a stroke or brain tumor. Bulging eyes can signal thyroid disease. 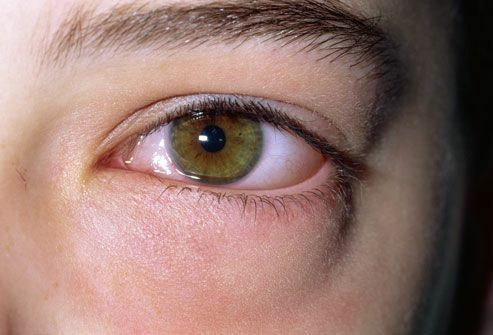 A yellow tint in the whites of your eyes might be sign of liver problems. 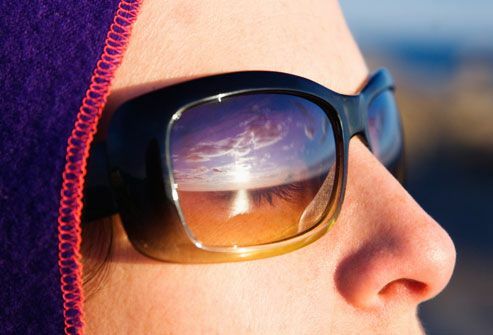 UV rays can harm your eyes. Exposure can cause you to get cataracts 8-10 years earlier than normal. Just one long session in the sun can cause very painful irritation of your corneas. So wear a hat and sunglasses that block UV rays. You can add a clear, protective UV-blocking film to your car’s side windows, too. If you have light-colored eyes you may be more sensitive to light. If it suddenly starts to bother you more than usual, call your eye doctor. Grease splatters from a pan, yard debris flies up from the lawn mower, cleaning solution splashes in a bucket. 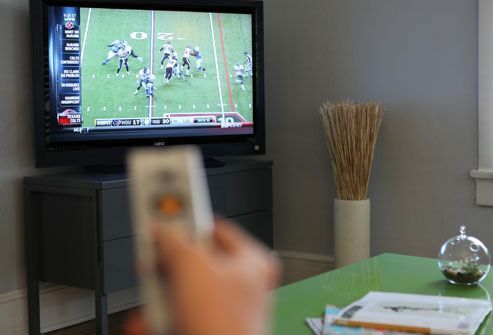 Some of the greatest eye hazards are in the home. 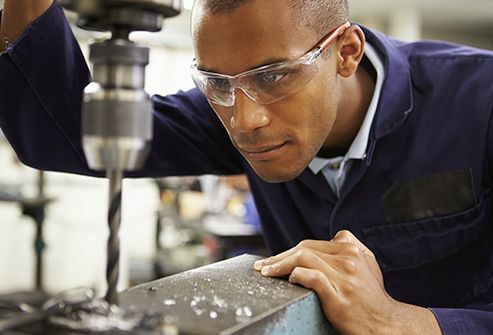 Eye doctors suggest everyone keep a pair of protective eyewear at home. Look for one approved by the American National Standards Institute. Even if an eye injury seems minor, go to the emergency room right away to get it checked out. 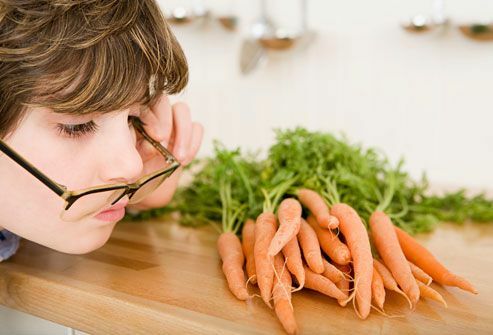 Carrots really are good for your eyes. So are spinach, nuts, oranges, beef, fish, whole grains, many other things that make up a healthy diet. Look for foods with antioxidants like omega-3 fatty acids; vitamins C, E, and beta-carotene; as well as zinc, lutein, and zeaxanthin. 23) Carolyn A. McKeone / Photo Researchers, Inc.
24) Dr P. Marazzi / Photo Researchers, Inc.
28) Dr. P. Marazzi / Photo Researchers, Inc.
National Eye Health Education Program, National Eye Institute. News release, National Eye Institute. American Optometric Association: "Optometric Clinical Practice Guideline Care of the Patient with Hyperopia." EyeCare America, The Foundation of the American Academy of Ophthalmology. McBrien, N. Optometry and Vision Science, 2009. American Academy of Ophthalmology: "Is LASIK for me? A Patient's Guide to Refractive Surgery." EyeSmart, Academy of Ophthalmology: "Eye Injuries at Home." Emory Eye Center: "Eye Conditions" and "Glaucoma." National Eye Institute: "Eye Health Tips." Genetics Home Reference: "Retinitis pigmentosa." Kids Health from Nemours: "Styes."